Blessings of pinball and booze. And money. I log in at 9:45 and it's Hipnosis. Has time elongated itself? Oh I get it, JM went over to make their marathon nut, bet that's it. Morning Everyone! All pledged and ready to go. Boo from the isthmus. I have to say I'm *shocked* the marathon is still going on. Why haven't the Koch brothers called in with a mega-pledge to shut it down? just when i thought wfmu couldn't get better....! GGG? Can you mention the context again? I missed this. Toy Love double LP on *white* vinyl is the first prize for pledges of $15 or more, and the Ahmed Janka Nabay LP "Bubu King" is the second prize! We'll be giving them away in just a few minutes, pledge now! More questions: is there a name for the symbol in the center of Scott M's icon? It looks like something for rigging ropes. hey Friday folks...gonna be in and out today but I thought I'd drop IN and say HI and throw a modest pledge your way. Steve in Cleveland! USA! USA! @Bad R: Thanks. I like that. And I bet it flies well. Thanks everyone! Keep pledging, this is awesome. How could you not want that Date Palms LP?? I'm going to play that on my next show ( if I remember)! The records we wore out because they were on to something great....and then completely lost the story. Tomasz, what did you previously think it meant? It just hit me this year that without knowing the House of Tomorrow pledge, the Mouse of Today lacks a little context. I'm an unrepentant heathen but gospel records like Reverend Charlie Jackson's will get me to church. yeah, tim. Him and Pastor John Rydgren. Just don't offer me watery coffee and church basement potluck nasty food. tim, you are thinking Lutherans. I am certain Charlie Jackson's congregation would "put their foot in" the catering. I turned into light pink! Why did I turn into light pink? 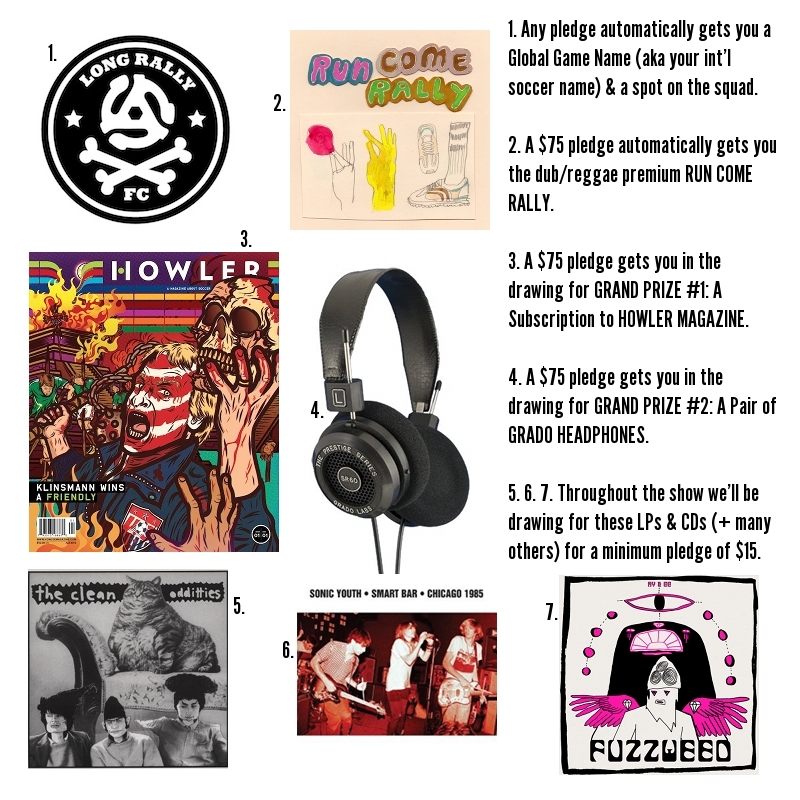 Here's the link to Howler magazine's video of issue #1: shop.howlermagazine.com A 75 pledge puts you in the running to win a one-year subscription. Pledge now at www.wfmu.org or call 1-800-989-9368! We've set a goal, and we are only halfway there! Please show your support for The Long Rally! Every dollar counts! I am truly tapped out now. Only 4 people are currently in the running for the Sun Ra CDs and The Clean double LP! The odds are in your favor! damn now I want to see them live. I saw them twice in a day once. Now I'm all spoiled. Can call you a slouch, I meant. Where else except WFMU can you hear Pere Ubu? Come on, folks, this is great music, every damn week! Is anyone old here enough to remember a time before dub? I mean, I heard it first on a Clash album and didn't know what to make of it. now even pop records have dub elements in them. Whoa...I don't think I've heard D'Angelo before. What album is this from? Totally talked a new friend who's never listened to WFMU before to listen this morning. Hopefully he'll pledge too! Yo to Shana in Ann Arbor! That's pronounced "maskerano". That surname's Argentinian. hahahhahaha, Scott, love your Paris is Burning pronounciation of "extravaganza"
Phew! Almost forgot to donate from over here in England. God Bless WFMU and all it's awesomeness. Kinda slow here in the phone room, folks, please support Scott when he needs you the most! The current song is giving me anxiety! Is every show going to go over now, or will we return to the schedule at some point?